My kids love heading to the snow cone shack on warm summer evenings, but with seven of us it ends up being at $15-$20 every time we go. I recently realized I could make snow cones at home for way less money, and I figured out how to make them sugar free (without buying pricey syrups)! The kids get a fun snack without the sugar, and I save my money for expensive ice cream to eat after they go to bed. Sounds perfect, don’t you think? The one thing you do need is a way to make shaved ice at home. 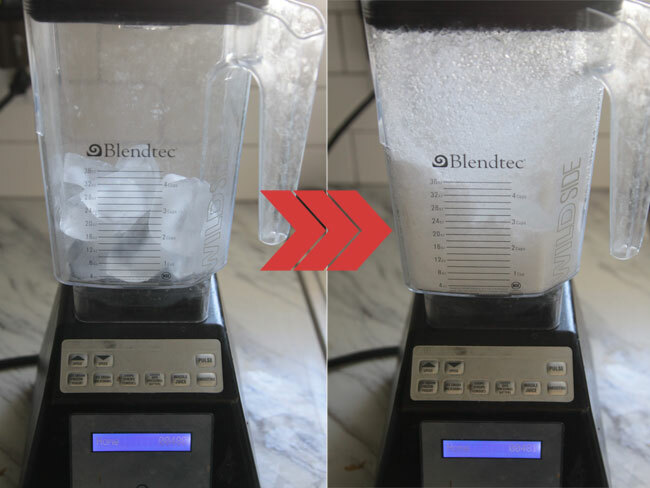 I have a Blendtec blender, and it makes “snow” from ice cubes in seconds. Literally. Just dump a tray of ice in, press ice crush, and about 15 seconds later you’ve got snow. You can crush ice with a VitaMix blender too, although you’ll want to google the proper procedure. If you don’t have a heavy duty blender, you can get a great deal on an electric Snow Cone Maker from Amazon – only $23 right now (marked down from $80). If your family likes snow cones, it’ll pay for itself quickly! Instead of buying expensive syrups in one or two flavors, I figured out how to make my own in just about any flavor. I made sugar-free snow cone “syrup” three different ways: 1) using Crystal Light drink mix, 2) using Kool-aid and Splenda, and 3) using the small containers of liquid “water enhancer.” With all these options, any flavor in the drink mix aisle can become a snow cone (cherry limeade, lemonade, fruit punch, blue raspberry, apple, coconut, lemon lime, berry burst, watermelon, you name it!). I bought clear squeeze bottles from Walmart for 98 cents each, then used them to hold a concentrated flavoring for the snow cones. Since there’s no sugar in these sugar free concentrates they aren’t as thick as a traditional snow cone syrup, but the squeeze bottles have such a small opening that it’s still very easy to squirt them on the snow. The kids loved all the flavors we tried and no one could tell they were sugar free. 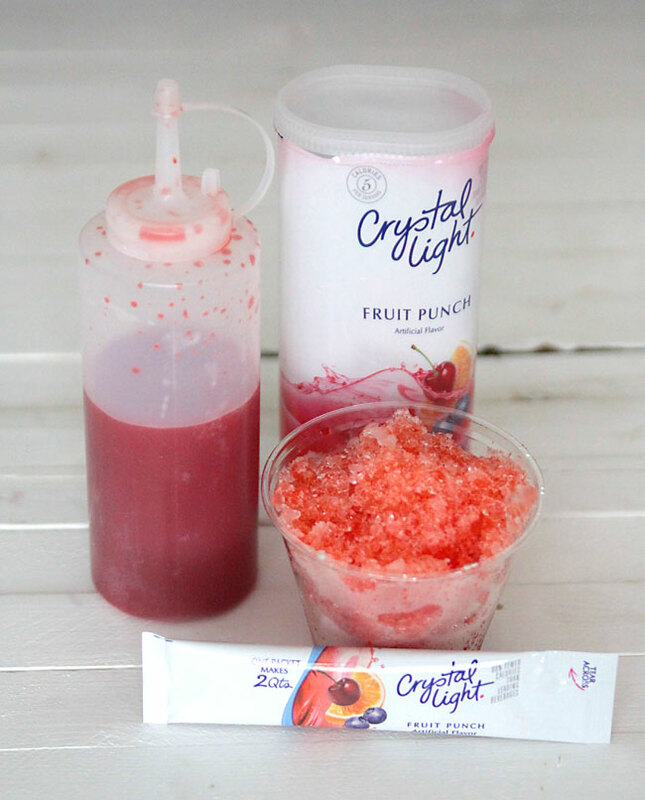 For Crystal Light sugar free snow cone syrup I used one packet (for use with 2 quarts of water) and mixed it with 1 cup of water. I whisked to combine, then poured the concentrate into the squeeze bottle. 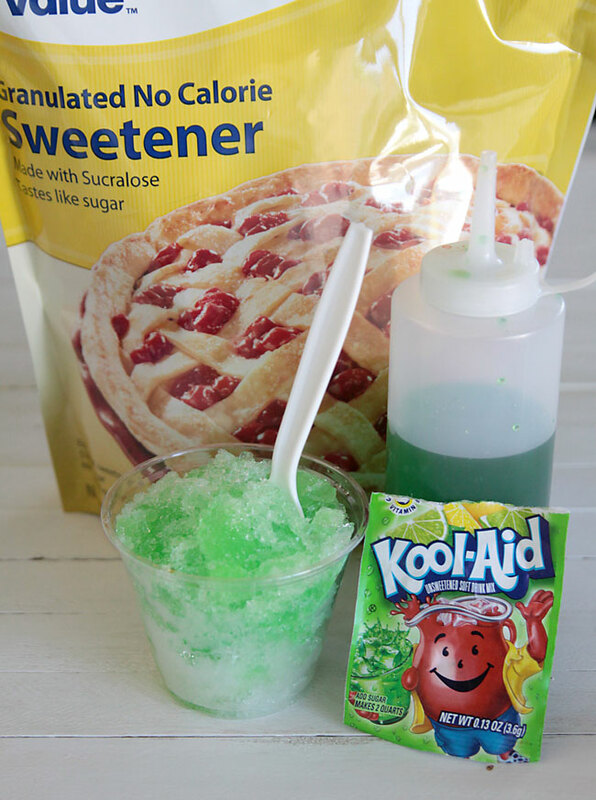 For Kool-Aid sugar free snow cone syrup I mixed 1 packet of Kool-Aid with 1 cup of Splenda and 1 cup of water, whisking to combine. Into the squeeze bottle! We used lemon-lime and it was really, really good. If you prefer, I’m sure you could use Stevia instead of Splenda. 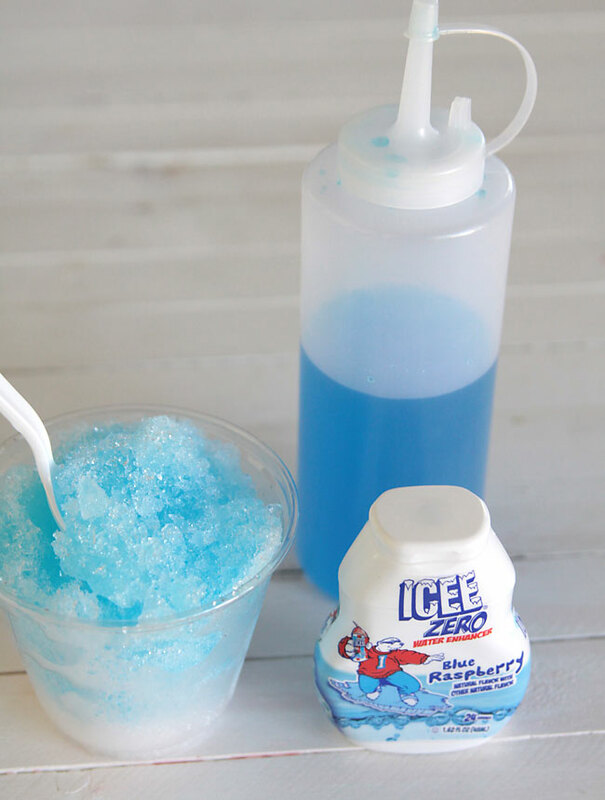 For sugar free snow cone syrup made with water enhancer, mix 1 tablespoon water enhancer with 1 cup of water, then pour it into the squeeze bottle. You may need to experiment a little with different water enhancer flavors to figure out the concentration you prefer. We tried the ICEE blue raspberry flavor and it seemed quite strong and not quite as sweet as the other two varieties. It was certainly easy, however! Each squeeze bottle is enough to flavor 6-8 snow cones, enough for our whole family, and I’d say the cost for one bottle’s worth of syrup/concentrate is under 75 cents. Pretty good compared to almost $20 at the shave ice shack! I love this idea! Maybe I can try juices of some sort! I don’t let my family have aspartame. I’d much rather them have real sugar and limit intake. Much healthier! Sure! I think fruit juice concentrates would probably work great! Stevia is natural so u can use it instead as well. Stevia comes from the ragweed family. Be mindful of allergies. I use Stevia in my coffee and anything that calls for sugar. I tried Splenda but to me it has a bitter taste. My favorite is cherry. 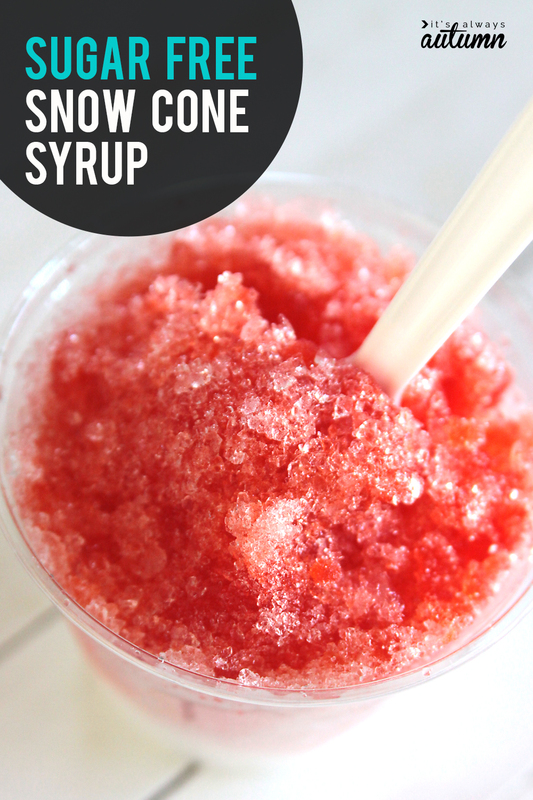 how fun, I just ran across this post via Pinterest, and I had posted about making really easy shaved ice a couple weeks ago (my name has the link 🙂 I skipped even making the syrup, just using a little powder works great if you stir it in. There are some new water enhancers that use stevia instead of aspartame or Splenda — Skinny Girl is the brand name. I love this idea and I keep the Skinny Girl enhancers in my cupboards for days when plain ol’ water won’t cut it. Thanks for the post! Yep! My husband really likes those. I was going to use some for the post, but the color is not nearly as bright in them – which is probably a good thing – less dye, etc – it just didn’t make for nearly as pretty photographs! I love Flavrz for a natural way of flavoring water. There are many options on their website at http://www.flavrzdrinkmix.com. I can not have splenda or any sweeteners due to migraines, so my son is also not allowed to have them. The Flavrz drink mix is the best option I have found & it tastes great! They can be difficult to find in stores though. Hope that helps…I may give this a try this summer. The drink mix comes concentrated already, so I think it would be a great option. Yay! What a fun idea, thanks for sharing. I have a BlendTec too and Homemade SnoCones is on our bucket list. Off to the store to buy packets…that alone will be a treat, I never buy any kind of juice. Great post, girl! I plan to try this using cranberry juice or orange juice frozen as cubes and then processed into snow using our Ninja blender. Thanks for the idea. [email protected]. I was racking my brain to figure out how to so this at school without spending a bunch of money. This might work just fine. If it does, I will try it for water day. A big day for our pre-k kiddos. Thanks for the post! Genius! We love snow cones, but it’s crazy expensive – I need to pull out my blender and see if it can crush ice. Thanks for the recipes!! Instead of using 1 Cup of Splenda with Kool-Aid, would plain sugar work, in the same amount, since that’s how you make the Kool-Aid to drink? I think these sound great…can’t wait to try! Yes, it should work just fine with sugar. Just stir well to make sure it gets completely dissolved – if it doesn’t seem like it’s dissolving you might need to bring it up to a quick boil, then cool and use as shown! Excellent ideas Thank You for sharing them !!! I was tickled to see this on Pinterest cause I had just made some Kiwi Strawberry slushies with the water enhancer and was glad I wasn’t the only one who had the idea. I had put some ice into my Ninja and made snow then added some water enhancer. It was a little strong and I think next I will use less and try your recipe out, but it definetly has potential. I have made my own syrup with koolaid, sugar, and water but I have always boiled my sugar water and the added the flavor. I’m going to have to try it your wa. For those who do not have a blender that will sliver ice, go to Walmart and buy the Rival Snow Cone Maker. I paid $20 for it and it makes perfect snow cones fast. I appreciate the tips on making your own syrup. I couldn’t believe the prices when I went to order some online. This recipe looks wonderfully simple. I never made snow cones myself before, but am gonna try hands on it now. Let me see how nice they taste. I love the shaved ice over the snow cone type. I just ordered a machine with syrups from Hawaian Shaved ice on sale and it came with three syrups. My husband is a diabetic, so instead of ordering the sugar free syrups online, I will try making some myself with KoolAid or Crystal Light. I don’t need all the sugar either. Sometimes when I went to Pelicans, I got half and half. Yes..condensed milk is great on the snow balls. You can dilute it with evaporated milk. We spent a lot of money this summer on snow balls after working out at the gym. Thanks for the tips. Please be careful, you should opt for Stevia instead, as Splenda being Synthetic, it is the 6th in the Sythetic line of Sugars, which is a NeuroToxin! I wonder if you could use a bit of gelatin (flavored or unflavored) to thicken the syrup when you use stevia instead of sugar. Great idea! !My favourite summer (anytime really) treat is the snow cone! Hah hah ha! Really epic!! 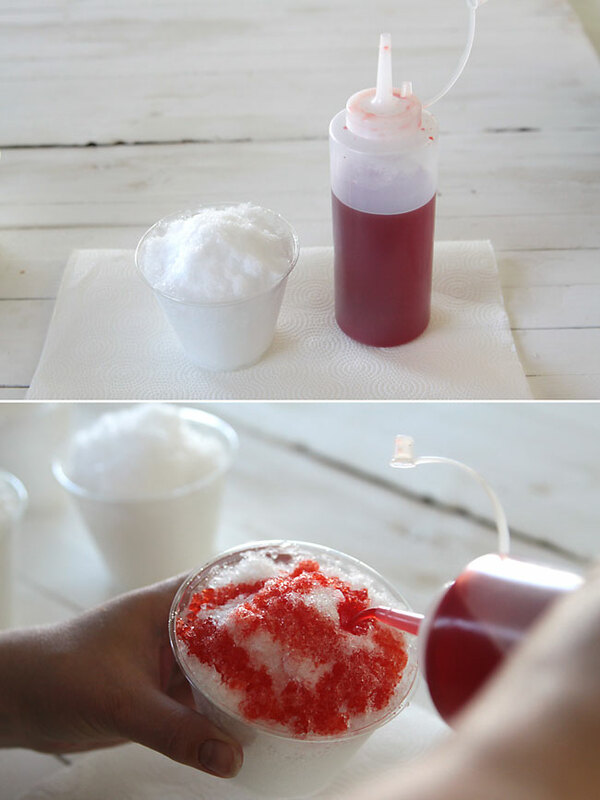 Snow cone without sugar. I never seen this type of recipe before. But I’ve a top 10 homemade snow cone machine recipes, you may check: https://homeholds.com/homemade-snow-cone-syrup-recipes/ and if possible, share your experience. Thanks. I’ve always been a fan of snow cones and I do know that they aren’t the healthiest thing out there. I’ll have to try your sugar-free syrup recipe since I am trying to eat healthy and save money too. Seeing as the instructions you listed aren’t too difficult to do, I’ll have to set some time aside and make them. I know a company that uses Sweetened Condensed Milk on top of the flavorings. That makes it extra special! And, it tastes SO Good. If you are trying to avoid sugar, this recipe is NOT for you. But, as a special treat, every once in a great while, try it! You’ll LOVE it! !